An easy, no-bake vanilla cheesecake topped with a tropical fruit salad and an orange and passion fruit drizzle. A delicious no-bake vanilla cheesecake served with caramel sauce and mixed nut nougatine. 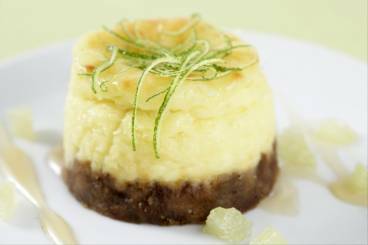 A delicious oven baked cheesecake made with lime zest and cream cheese. 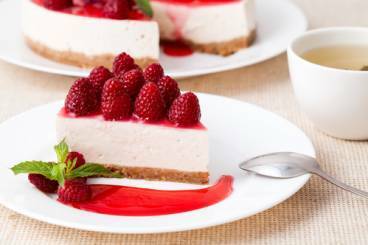 Baked cheesecake made with Italian Ricotta. Served with a Grand Marnier flavoured raspberry caramel. A light cheesecake with a brittle biscuit base and a topping of salted caramel. 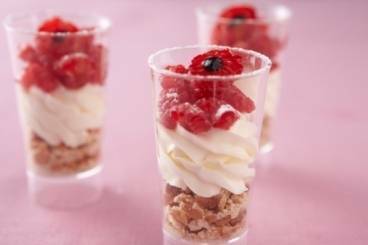 Super simple vanilla cheesecakes made with cream cheese, digestive biscuits and a strawberry jam topping.